The dress code of travelling has changed, but have the standards slipped? Judging by the name, which was coined during the 1970s, the business class of aviation should have been frequented, exclusively, by business people. It had been invented as a stratum between the first class traveller and the humble tourist (who later became the economy traveller) class cabins. Tickets sold for half the price of first class, and, almost universally replaced it. 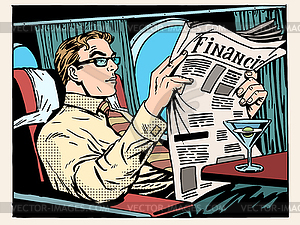 And it was expected that only businessmen would fly in business class, after all, it was they who would benefit the most from paying full price and being granted the possibility to change departure flight dates, to register without queues, to check oversized baggage and drink Champagne. It was precisely for all of these comforts that they needed to pay full price. But not on their own, instead with corporate money. And it was for their comfort that, during the inception of the business class, rules of etiquette where introduced in the cabin. These were rules, both written and unwritten. For example, men were relied on to wear suits with ties, and women, to wear dresses. A suit, of course, did not mean a tracksuit, or sports jersey, or plush pyjamas, but rather a suit was a pressed, three piece business ensemble including vest, together with which one wore a white dress shirt, and polished shoes. However, a suitcase on wheels did not suit the occasion. One boarded with an attache case or briefcase instead. And jeans? Don’t kid yourself! Jeans belonged economy class, but even there, behind the curtain, appearing in shorts, track pants, or open shoes was considered indecent. Moreover, shorts and flip-flops were dedicated exclusively to the beach. Was this dress code something exclusive to aviation? Certainly not. In the majority of grand hotels (as well as restaurants and theatres) dressing smart was a strict rule. It was not long ago that wearing jeans in the lobby of London’s The Ritz hotel was forbidden, so “uncouth” guests would be obliged to literally run to the elevator. And before breakfast and tea, guests had to be dressed according to the house rules. The history of proper attire in the halls of hotels and in airline cabins is a class history, in every sense of the word. The price of a ticket (and room) provided not only privileges, but also imposed obligations — in one’s surroundings and stratum. Princes and the poor did not mix, they were not only separated by curtains between cabins, but also by the value of the fabric of their smart attire. I remember my first flight across the Atlantic in business class. It was in 1997, the paperwork, which accompanied the ticket, clearly stated how one should dress for the flight. Dress attire was no longer necessary, but jeans were still prohibited. But is it better that all of these rules have been consigned to the history books? It is difficult to say. In a world where a twenty-year-old chap — having successfully sold his application to a smartphone company, who is worth more than the president of another corporation — cannot wear a jersey and sneakers, is nonsense. But no one has dressed up to fly in a long time, and even the president of Peru, who I once met in business class, had boarded the plane in a blazer and trousers, only to immediately change into jeans and a baseball jacket, upon boarding. In the end, cabin armchairs now open out into beds, and lying in a bed in a suit is as controversial as wearing a tracksuit to the theatre. On the other hand, a flight over the ocean (like a trip to the opera, or to a three star restaurant, or to The Ritz) has ceased being a ritual. Nevertheless, it can be said with confidence, that we will not be seeing any stewardesses wearing fashionable ripped jeans in business class. Here, dress code, bound by the decorum of the flight crew, is not mere convention, but a sign of respect for passengers. And this is yet to change.